Whether you need a new website built from scratch, or an update for your existing site, the most important step in creating a site that meets your goals is planning. Planning a website must address topics such as the overall look, feel, appearance and navigation of your site. However, the planning phase needs to focus on the goals and objectives you want your site to achieve. To that end, our Website Planner Workbook helps you, our designers and programmers build a site that meets your criteria. We deliver the many skill sets needed: digital graphics design, layout and composition talent, HTML and other programming expertise among them. Your contribution in the planning phase leads to an effective, customer-driven and well-designed web presence. Web design technology evolves continuously. Today you can take advantage of several popular design choices and perhaps even mix a few of them together. We’ll work with you and explain the pros and cons of each, including a few design styles and issues noted below that are currently relevant. We believe your site needs to be usable on any device. According to the International Telecommunications Union, more than 2.7 billion people use the Internet. Nearly 2.1 billion carry a mobile device with a broadband connection. 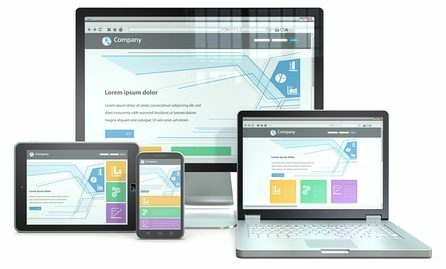 Responsive Web Design uses technology that automatically adjusts the presentation of your website to display properly on laptops, desktops, cell phones and tablets. This is a minimalist design approach that delivers a clean, uncomplicated look to a web page. It uses simple design elements. It forgoes embellishments and features that create shadows, gradients and decorative features. It allows visitors to avoid the question: “What do I click first to find the answer I’m looking for?” For example, Google.com uses a flat design. Video can inform and educate your visitors. It can often reveal details the visitor is seeking. We can discuss the use of Flash versus HTML5 and show you the pros and cons involved in each. Websites can be built that allow the user to scroll down the page without limit. This technology is especially helpful for displaying your website on a small screen (cell phone). It avoids the nuisance of having to load a new page to continue reading an article or product description. Joomla is a powerful tool that allows us to build professional websites. It’s both a design platform and a content management system (CMS). It gives you the ability to manage and update your site on your own. If you anticipate frequent changes, contact us to learn more about Joomla’s CMS and how you can use it to add blog articles, add and update product information and much more. In addition to Joomla’s CMS, WordPress offers its own rich system that allows you to add and update content as you wish. We have deep knowledge of WordPress as well as its plug-ins, themes and features. Be sure to ask our advice if managing your own content is part of your plan.